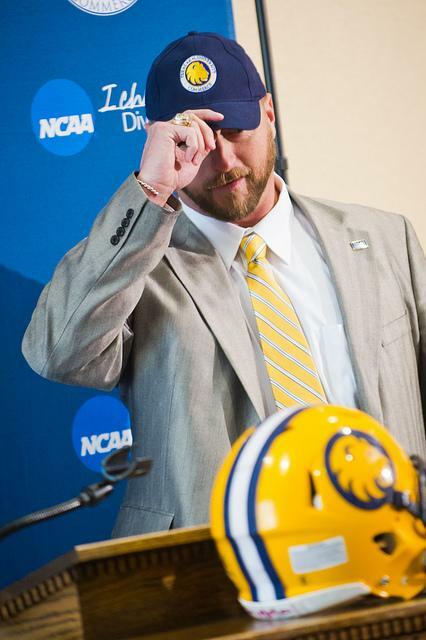 My own kind of hat: Colby Carthel, who wore maroon for seven years as defensive coordinator at West Texas A&M, puts on a blue Texas A&M University-Commerce cap at the annoucement of his hiring as the schools' new head football coach on Tuesday. 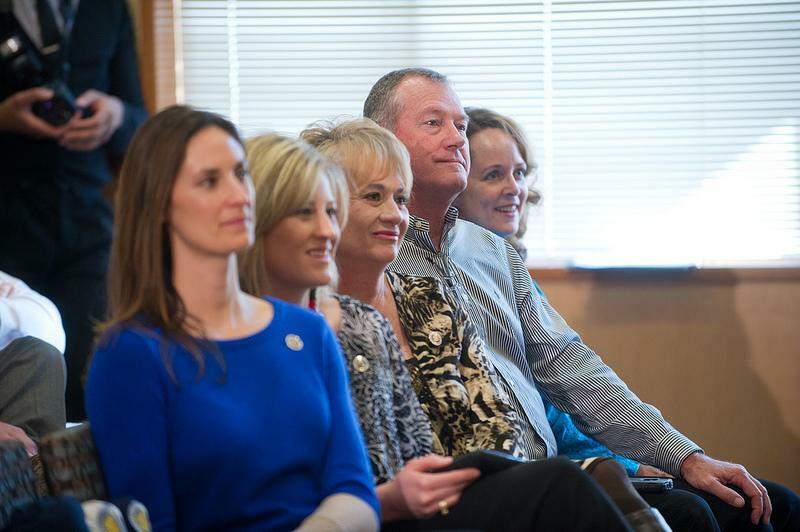 Colby Carthel's parents, Cindy and Don Carthel, center and center right, watch their son address Texas A&M University-Commerce football supporters at the announcement of his hiring as head coach. Don Carthel is head football coach at West Texas A&M. Colby Carthel, center, was named the new head football coach at Texas A&M University-Commerce at a news conference hosted by university president Dan Jones, left, and athletic director Ryan Ivey at the Sam Rayburn Student Center on Tuesday. New A&M-Commerce head football coach Colby Carthel, left, speaks with university alumnus Bedford Page following the annoucement of Carthel's hiring on Tuesday. Colby Carthel, newly hired as Texas A&M University-Commerce's head football coach, addresses a press conference on campus Tuesday. Carthel had spent the last seven seasons as the defensive coordinator at West Texas A&M. A&M-Commerce announced the hiring of Colby Carthel as new head football coach on Tuesday. Carthel had spent the last seven seasons as the defensive coordinator at West Texas A&M, where his father, Don Carthel, is head football coach. At a campus press conference Tuesday morning, Colby Carthel emphasized recruiting as a central priority in reviving the fortunes of the A&M-Commerce football team, which finished with 1-9 records in 2012 and 2011. Carthel said that the recruiting potential at a university near both the Dallas-Fort Worth metroplex and the East Texas region influenced his decision to accept the position. Carthel replaces former head coach Guy Morriss, who compiled a 10-31 record in four seasons at A&M-Commerce. Morriss remains on staff as a special assistant to newly hired athletic director Ryan Ivey. Don Carthel said that he welcomes his son’s new job, despite the fact that he’ll be competing with the younger Carthel on the field and in recruiting efforts. Before coming to WT, Colby Carthel spent six seasons as the defensive line coach and recruiting coordinator at Abilene Christian. A native of Friona, a town in the southwestern Texas Panhandle, Carthel graduated from and played football at Angelo State, where he was a four-year letter-winner in football as well as track and field. Following the news conference, attendees had a chance to talk to Carthel. Some expressed their optimism about his ability to bring success to a to a program that has not had a winning season since 2001, when the Lions went 7-4. Since then, A&M-Commerce has finished .500 four times and experienced seven losing seasons. "I liked what he had to say," said Lester Williams of Dallas, an East Texas State alumnus and defensive end on the 1972 team that won the National Intercollegiate Athletic Association national championship. "I'm glad he mentioned the team that I was on." Harnell Williams, Lester Williams' wife and also an ETSU alumna, echoed her husband's enthusiasm. "(Carthel) seemed to just have a real zeal for being at A&M-Commerce and for winning," Williams said. "I think he'll be excellent for A&M-Commerce - brings back old memories. So we'll see how it works." While at West Texas A&M, Carthel was part of a team that made a postseason appearance every year and advanced to the NCAA Division II semifinals last season. Carthel said that the experience of making it to the final four of D-II football taught him, among many things, the importance of team chemistry. "It's about building a team that loves each other - coaches that love players and players that love coaches," Carthel said. "All these guys right over here from West Texas will tell you - this year wasn't our most talented team we've ever had there. But it was the closest unit and the biggest family-type atmosphere that we've put on the field and it showed." The announcement of Carthel's hiring came just two weeks after the naming of Ivey as the new athletic director in what has been a busy month for Lions football news. A&M-Commerce president Dan Jones served as chair for a meeting of the Lone Star Conference Council of Presidents in Grapevine on Jan. 18. 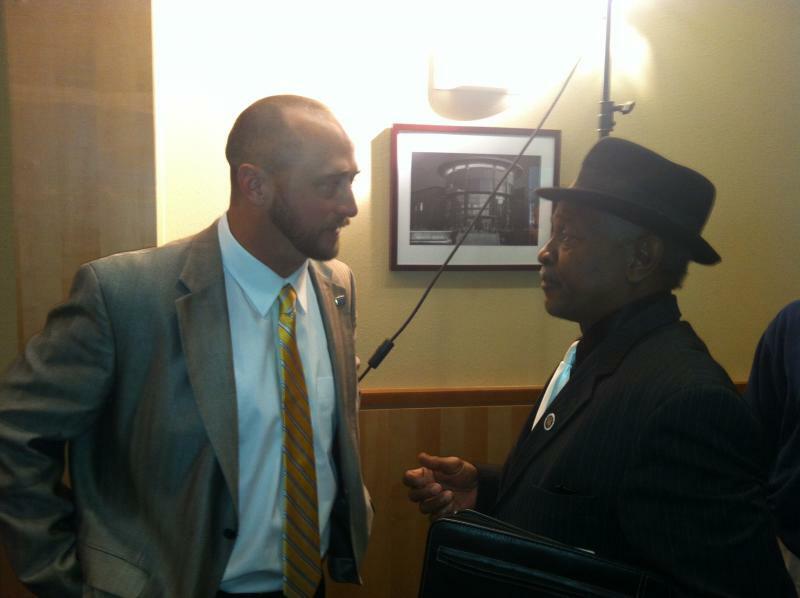 At that meeting, the group voted to begin determining an LSC football champion with a playoff system beginning in 2014. According to the plan, teams will play six conference games over the first nine weeks of an 11-week regular season, then split into two brackets to conduct a two-week conference playoff.